October 2013. Just back from a month in Nepal trekking for two weeks in Upper Mustang and looking around Kathmandu. Kathmandu has changed utterly since my fist visit in 1980, shabby modernisation has arrived along with a tenfold increase in population. But the back alleys and courtyards are still fascinating with their numerous Buddhist shrines and old statues of the elephant headed hindu god Ganesh. Stone statues of Ganesh are everywhere, their foreheads smeared with red sandalwood paste and surrounded by a scattering of flowers. 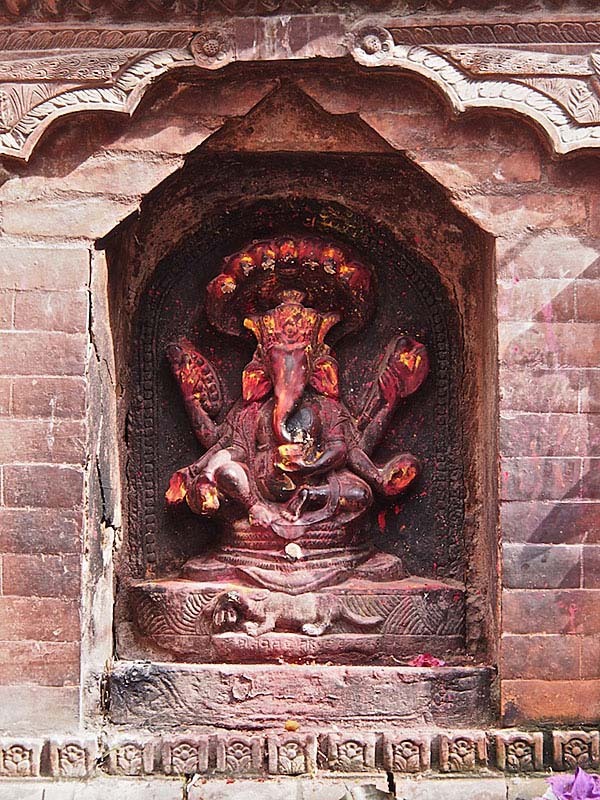 The two photographs below were taken in Kathmandu, the first shows Ganesh with a mouse at his feet, the mouse is called his vehicle in the world. Ganesh is the offspring of Shiva and Parvati and the second image shows Shiva and Parvati with Ganesh below them. 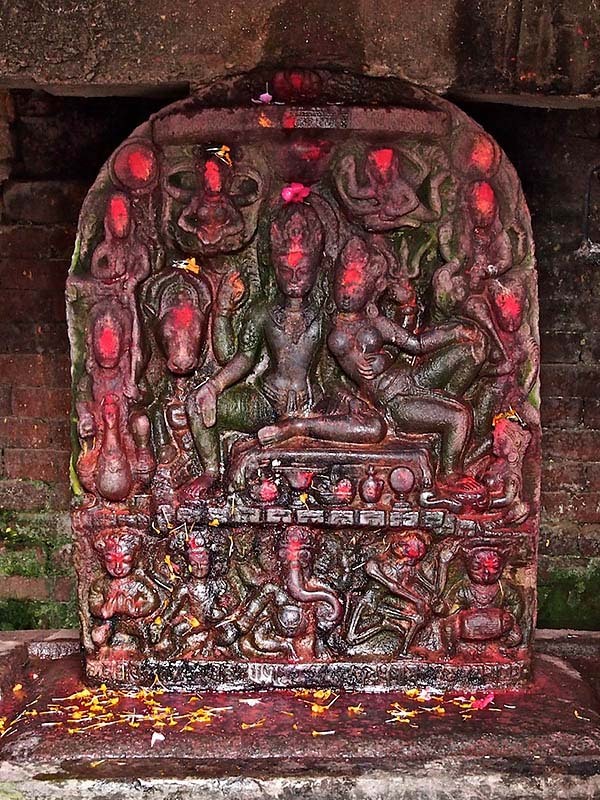 As part of their puja rituals the Nepalis will pat Ganesh's forehead, some of the statues are so old, and have had their heads rubbed by hundreds of hands every day, that their features have almost disappeared. Nepal is these days described as a secular republic but the impact of Hindu and Buddhist religions on the cultural life of most people seems as strong as ever. 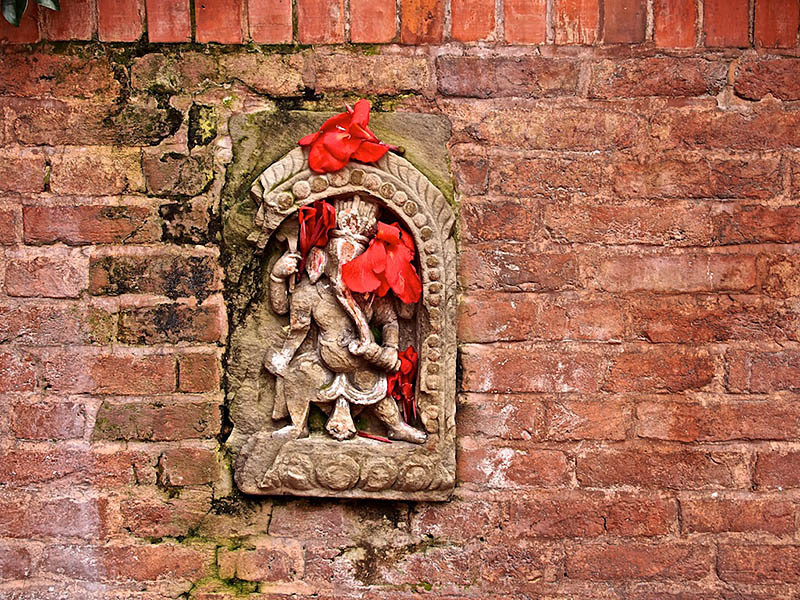 This old carving of Ganesh has been placed in a brick wall that is part of the Royal Palace in Patan, a beautiful small town 5 miles from Kathmandu. 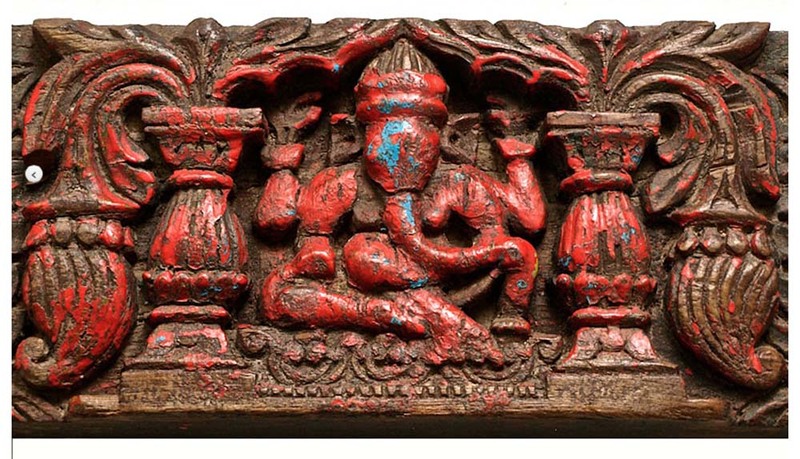 Almost every wooden panel in Nepal is covered with carvings and you'll also see small Ganesh statues incorporated in the carved wooden decorative friezes that surround doorways and temples, the wood often bleached grey by the sun and deeply eroded by the rain and passage of time. See Ganesh statues for sale on our on our page of Ganesh statues.